I’ve just started work on a search engine optimisation campaign for a new client. They have a Magento shop, that’s been running for just over two years, and they’re obviously looking to improve its performance. Before I start such a campaign, I first take some time analysing the market, etc, but also looking at the website itself, particularly at the conversion process and conversion rates. Its a simple question really, why send extra visitors to a website if they’re not going to convert into customers once they’re there? 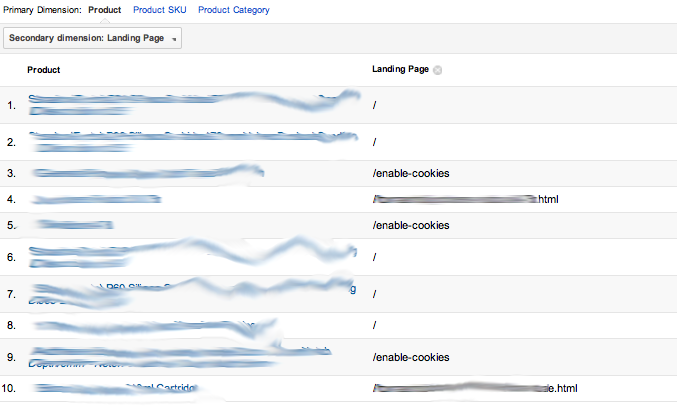 The first step then is to look at the site’s Google Analytics (you are using Google Analytics, right?). What was clear is that nearly a third of the shop’s buyers were being confronted with the Magento default “enable cookies” page when checking out. I found this out by looking at the Ecommerce Product Performance report & using the “Landing Page” Secondary Dimension filter. This report shows what page the user was on immediately before they enter the checkout sales funnel. In this instance, an unacceptably large number (ie, greater than none!) were being told that they had to enable cookies in their browser and were then confronted with how to do so (“in Internet Explorer, go to Tools …..”, etc). The cause of this issue was a poorly configured Magento shop – setting the correct cookie path & cookie domain is all that was required to overcome this issue. This is a classic example of the need to thoroughly audit any web property before embarking upon a search engine optimisation campaign. 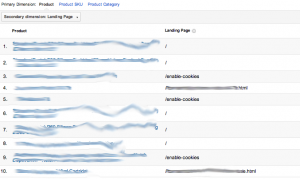 There’s no point sending lots more traffic to a website that’s not optimised for conversion. Its also a good example of the worth of a good analytics software – without it we would not have known that so many users were being told to mess with their browser’s cookie settings.